Every weekend I've been looking for hills to run in preparation for the Wasatch 100m (and its 57,000' of vertical change, yikes! 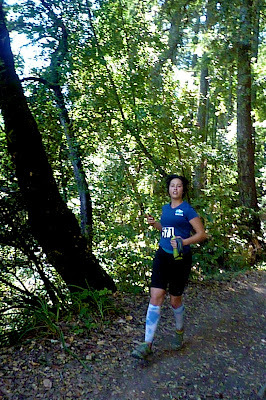 ), and last Sunday I had a chance to squeeze in the Sequoia 50k in Oakland, CA, as part of a big mileage training weekend. 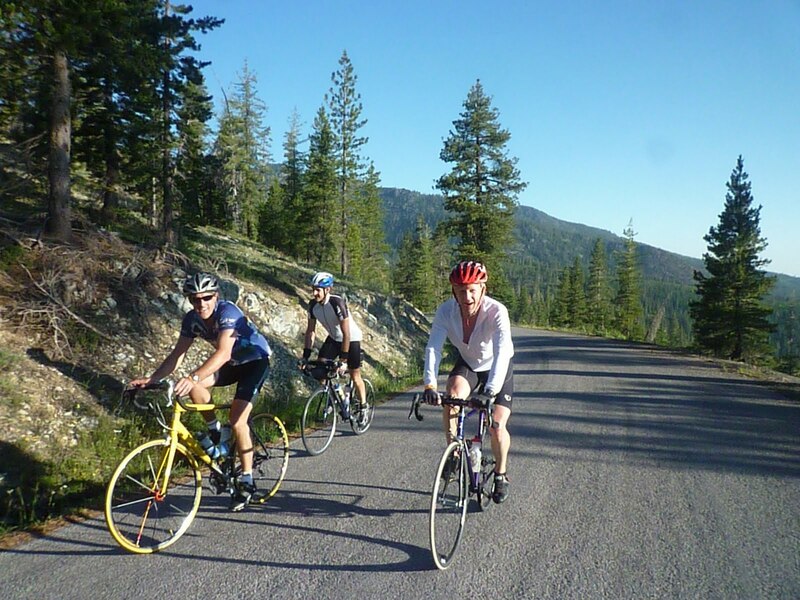 Here I thought California was hill country, but if you're looking for a climb of 3,000'+, you ain't gonna find it around here. 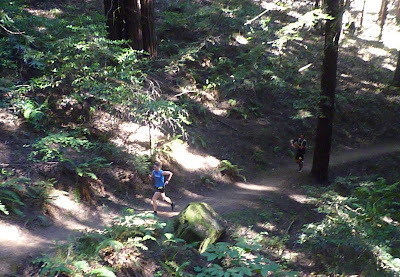 250+ other trail runners also joined in for this local favorite put on by Pacific Coast Trail Runs, with 10k/20k/30k/50k loop options to choose from. 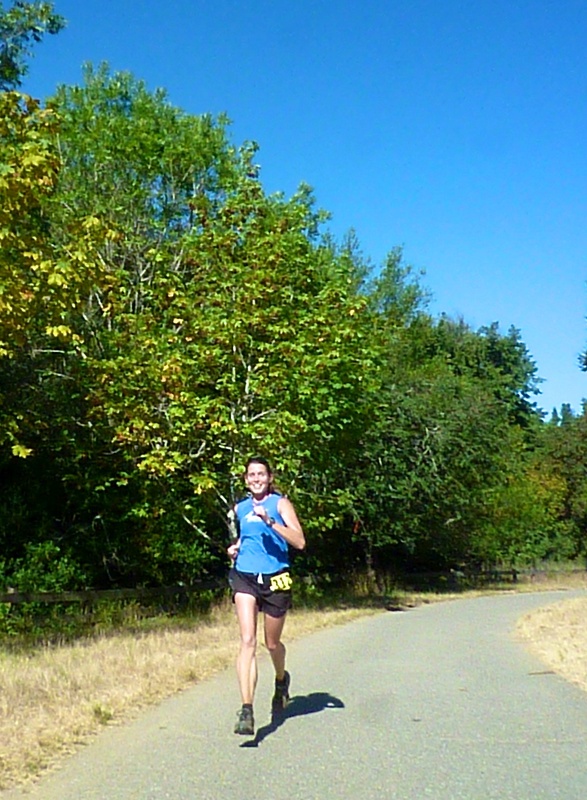 It was a beautiful warm day to test my race ready fitness for W100! "Race ready" was what I was shooting for, so I brought all the gear I was planning to use at Wasatch, did a pre-race hill workout to beat up my legs, and planned to stay aerobic the whole 50k, eating and drinking as if I had be ready for 70 more miles. I definitely got a few stares as I packed my new Salomon Advanced Skin X-Lab Hydration Pack with a jacket, gloves, hat, and enough food for the weekend in the 70 degree morning. 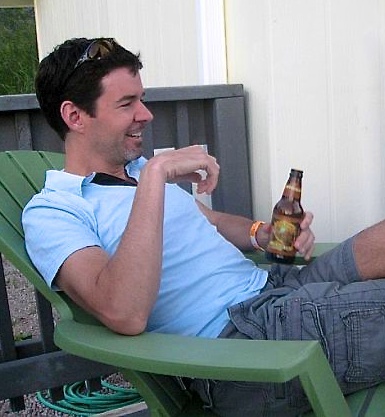 One thing for sure is that I was relaxed. Just two weeks ago, Christi and I were seriously contemplating moving the family to Washington, DC, or Austin, TX, in pursuit of some fascinating career opportunities, and I thought for sure my life of California trails would be over within the month. But a Silicon Valley company swooped in at the last minute and the match was good, so we're staying. Phew! I start my new job on September 12th...two days after Wasatch...ensuring the first day faux pas of Frankenstein posture in flop flops. But it also leaves me with a rare few weeks to focus on training and getting Sophie Jane into kindergarten. 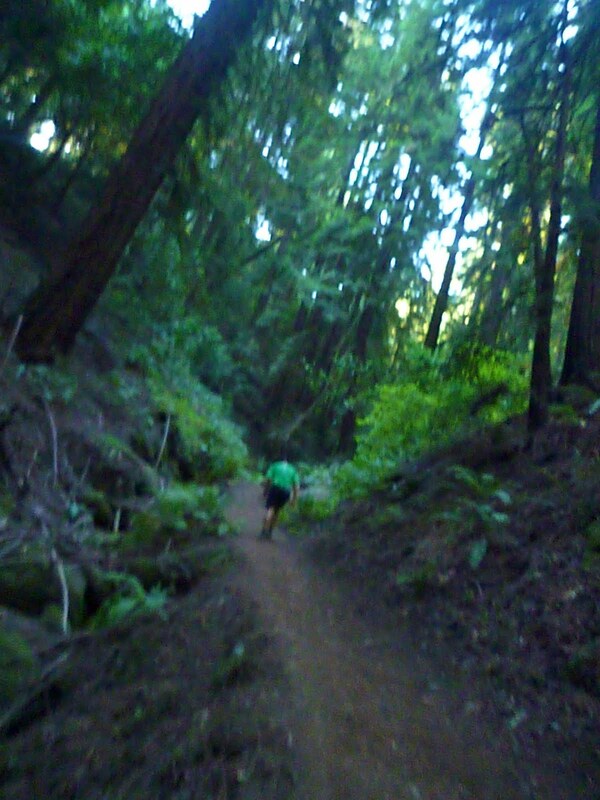 The trails feel brand new to me again, and I swear with every step that I won't take them for granted! Ultra legend Marshall Ulrich was here for the 50k, and also to sign copies of his great new book, Running on Empty. 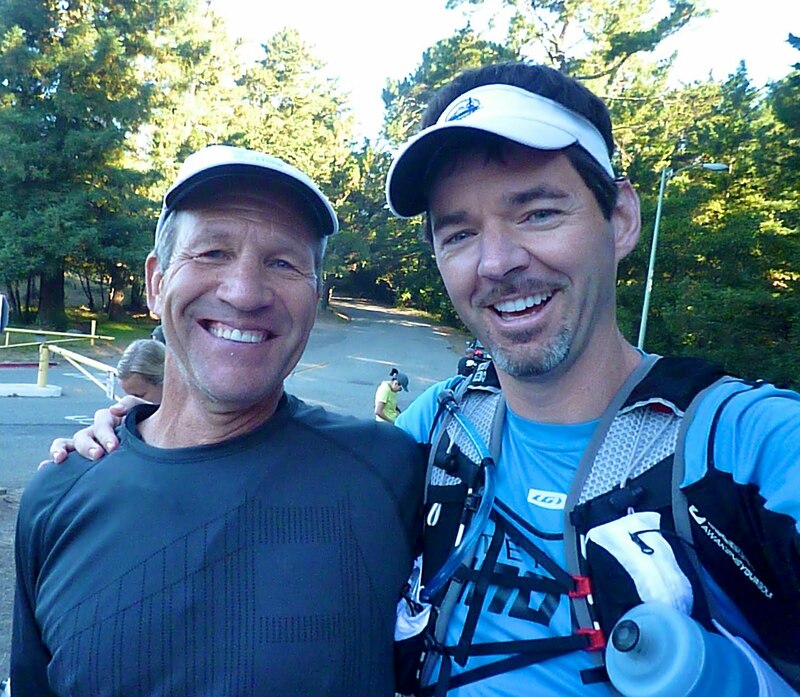 After running across America and climbing the Eiger for his 60th b-day, I'm sure this 50k is just a warm up jaunt! It was also great to meet Marshall's wife, Heather, one of my heroes from the book, and see that her enthusiasm was as contagious in person as it was in print. 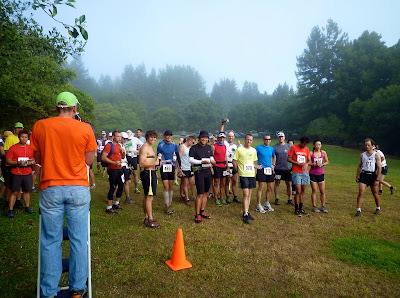 Before we knew it, we were called to the 8:30am start (30k and 50k runners first), and headed up beyond the cloud cover. 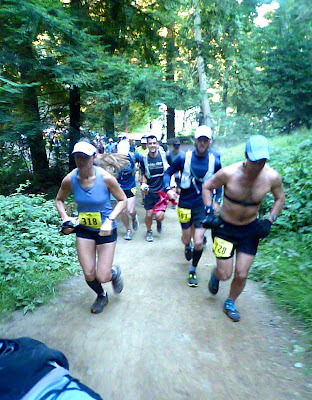 A group of eight went out fast, led by past 50k winner David La Duc (training for the Bear 100 and easily capable of a sub 4 hr 30 min finish time). 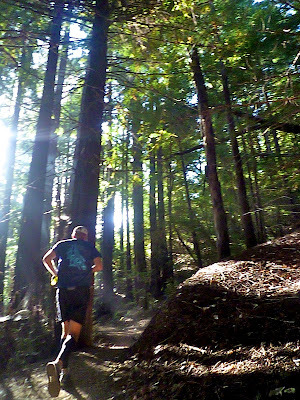 My self-imposed heart rate governor had me walking within the first half mile, chatting with fellow 50k runner Chris "call me Granger" Granger as we settled into a rhythm under the redwood canopy. It was warming up quickly, but would likely cap out in the high 80's, and we had some nice deep wooded canyons ahead to keep the sun off our shoulders. 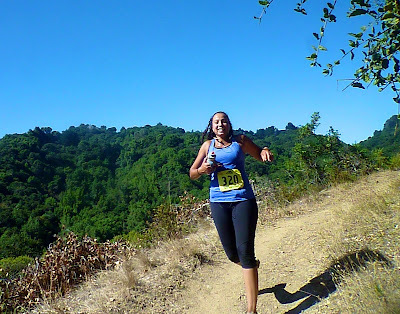 Thanks to the hydropack and packed food, I skipped the first aid station and went straight to dessert - the gorgeous French Trail tucked along the back of Joaquin Miller Park and into Redwood Regional Park. 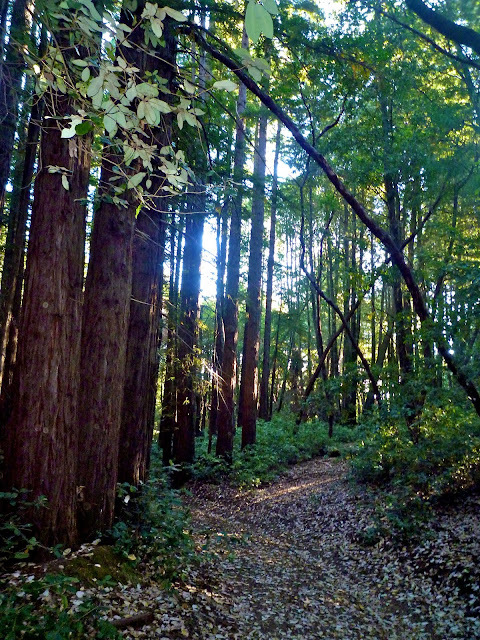 This trail never ceases to amaze me with its runnable single track and deep redwood gulch. We tackled the climbs with Rachel Niehuus and Sharon Medina, two female front runners in the 30k, leading the way. It was a long way to the second aid station (mile 11), and most folks were out of water by the time they arrived. David La Duc was in front with two others about ten minutes ahead of me, and I found myself in about sixth place. I refilled the hydration pack, plus filled an extra water bottle that I would use as a shower for the exposed climb back out. It was sweaty hot now, but I was feeling good at cruising speed. 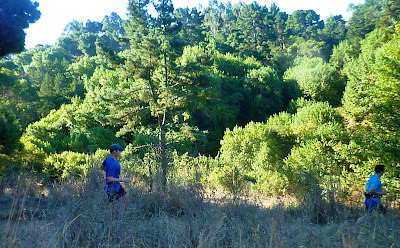 Rachel Niehuus and I reached the ridge together and began picking our way through the 20k runners who had started later. 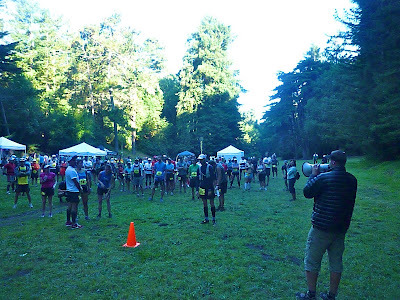 The rising temperature was taking its toll on many, and with 10-12k between aid stations, there was little room for error for those not keeping up on water intake or sunscreen. 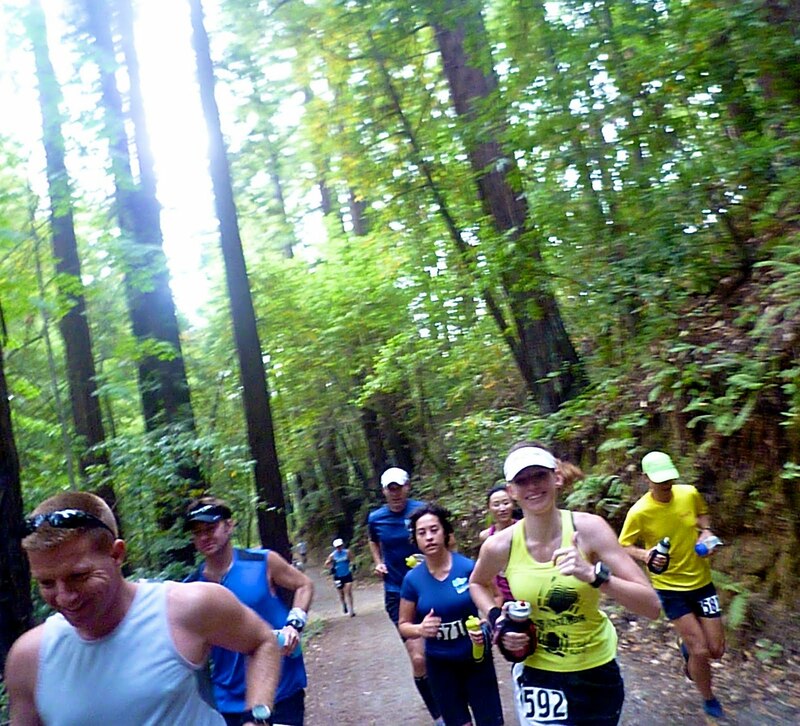 I handed my shower bottle to a few runners along the way, happy to be the only one insane enough to bring "too much" water. The mini-showers felt great, but unfortunately some of it got in my camera and it went kaput. Darn. Well, good to know. We hit the aid station again (25k), where dirt diva Catra Corbett and friends were happy to give some Wasatch pointers (bring Gore-Tex, it gets cold!) as I gulped down some Coke and PB&J. I was in a good place, and the miles were flying by. 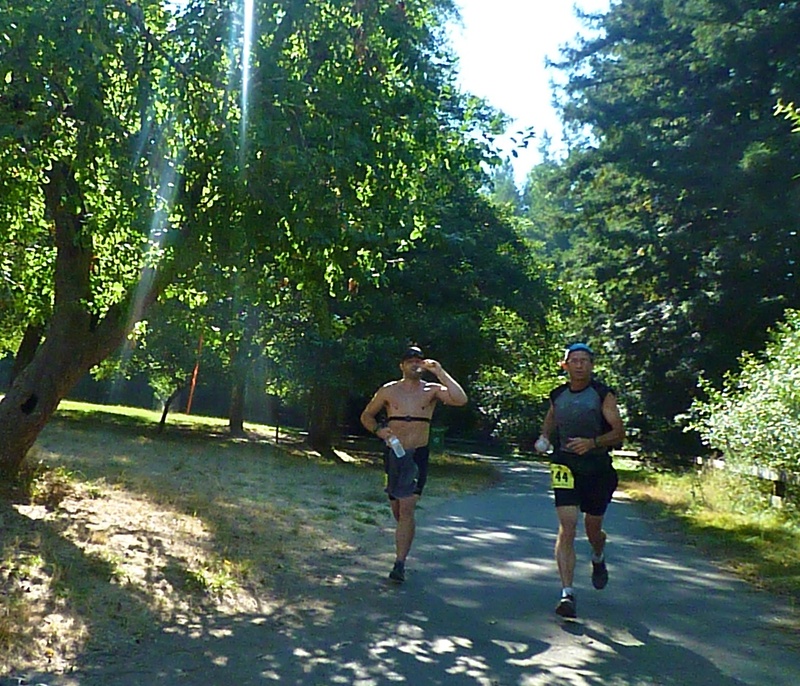 As I finished up the first loop (30k), I suddenly found myself all alone on the course as the 30k runners finished up and chilled in the shade. I slipped on the headphones and cranked up Soundgarden and Dead Weather, staying in that 150 bpm groove. Why 150 bpm? I had tested myself at the Stanford Human Performance Lab and found out that my aerobic zone goes to about 154 bpm, and I naturally feel a quickening of my breath at exactly 150 bpm, so it's easy to regulate without a heart rate monitor. It's also surprising how smooth a run can feel when you stay in this zone! I was all smiles. 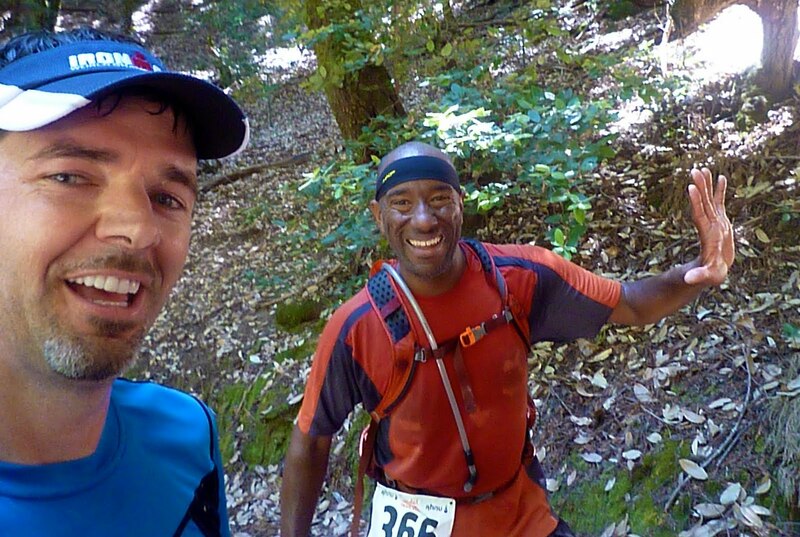 As I zoomed through the aid station again (35k), Brian Callejas from Fremont caught up to me and we tackled the French Trail together. 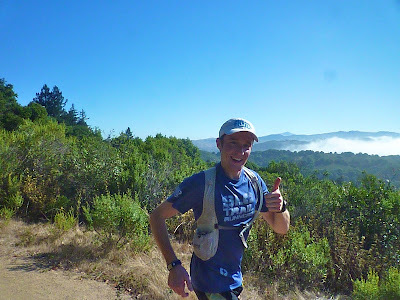 This was Brian's second 50k ever, and he was doing great! Clearly his cycling and short course running was keeping him very fit. He meticulously asked me about anything he could learn, and was happy to ease up the pace if a long answer was required. I loved that he had so much energy! At one point I got caught up in a story (who, me?) and tripped on a root, going down in the dirt enough to create a nice little cloud. I learned there is one drawback to carrying water bottles on your chest, and that is they will try to dig into your rib cage if you face plant! Brian helped me up and walked a few steps with me as I caught my breath, and within a few minutes we were chugging along again. Ah yes, the story...now, where was I? 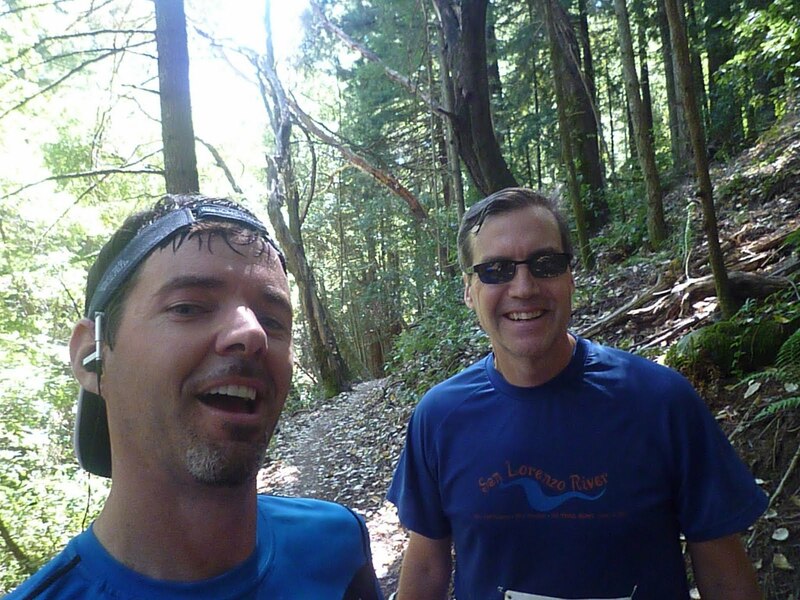 The last 10k was very hot and exposed, and Brian and I caught a few runners along the way as we picked up the pace to get to the shady parts. 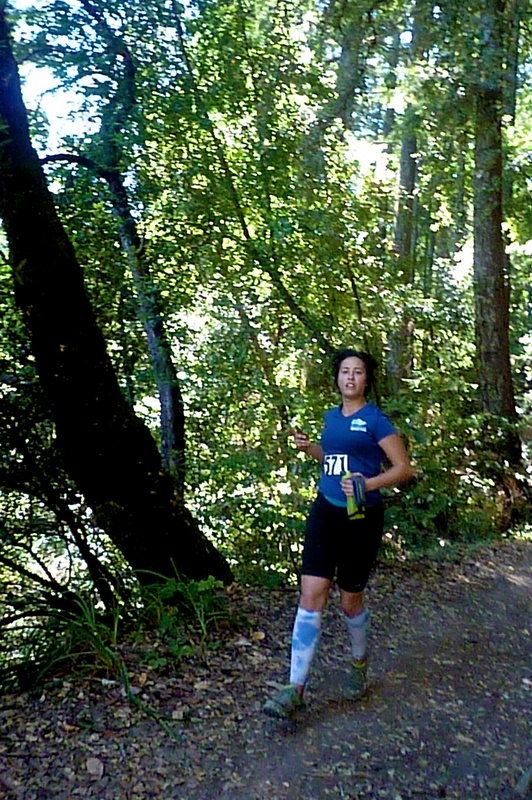 Shiran Kochavi was still looking good, but in need of water, as was Oakland's Barry Smith. Barry had just run the Pikes Peak Marathon LAST SUNDAY, and Brian and I were very impressed this 52-year-old was running at all! He let us know there had been a few drops, as well as few people kicking down to 30k once the heat started, and we were likely in 2nd and 3rd place. David La Duc was certainly out of reach at this point, but the rest of the podium was empty! Go as fast as you can without exceeding 150 bpm! The perfect 100-miler training. Brian smartly took his time at the last aid station (45k) to catch up on liquids, so I descended down to the finish alone in 5:00:18 for 2nd place. David La Duc had won in 4:50:30, with Brian coming in 2 minutes behind me and Barry Smith hanging on to finish just a few minutes behind Brian. 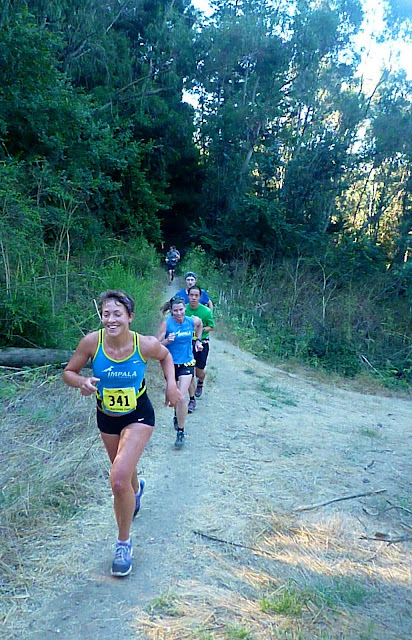 Seaside's Anna Komitov had picked her way through the pack to win the Women's division in 6th overall (5:14:00). Zephyr Cove's Steve Rodriguez (2:36:43) and Christa-Lynn Vampola (2:50:57) from Mountain View won the 30k. 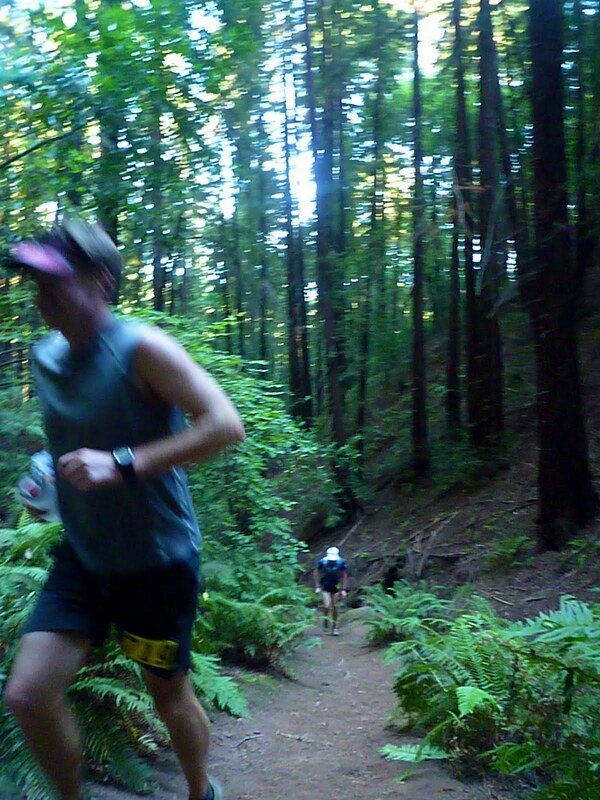 Marshall Ulrich cranked out a 6 hr finish in the 50k for 12th place! What a stud. (results) All in all, great performances by all of these runners on a hot day. Thanks to Sarah and the PCTR crew for a great day! 23-year-old Spanish phenom Kilian Jornet did the big double this year, adding a win at The North Face Ultra Trail de Mont Blanc (20:46:43) to match his first place at the Western States 100, arguably the two most competitive 100+ milers in the world. Fellow Spaniard Iker Karrera Aranburu (20:48:30) came in just a few minutes later with Frenchman Sebastien Chaigneau (20:55:51) not far behind. 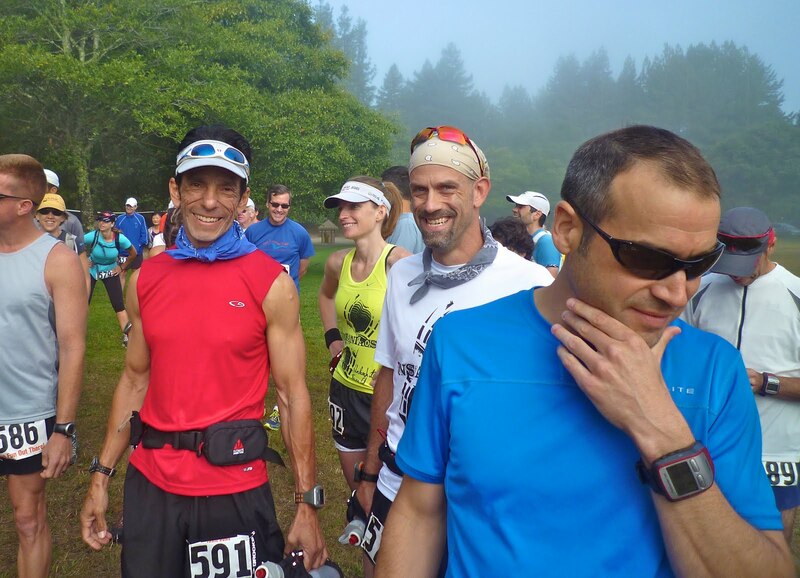 I wonder - is the double enough for Jornet to win UltraRunning Magazine's Ultra Runner of the Year, or will Dave Mackey prevail with his wins at Bandera 100k (CR), American River 50m, Miwok 100k, Where's Waldo 100k (CR), and 8th place sub-17 at States? That's a tough choice!!! Britain's Lizzie Hawker repeated her 2010 victory by finishing in 25 hours and change, notching her fourth win here. Nerea Martinez from Spain finished second nearly three hours later (27:55:34), with Darcy Africa taking 3rd (28:30:28). Bryon Powell, per usual, did an excellent write-up of both races on iRunFar. He also has interviews with Jornet and Hawker. North Face did a great video of the race course above. I bet Usain Bolt wish he had the calm consistency of Jornet, but instead he false-started and disqualified himself from the 100m World Championships (or did he?).Whoops. Oscar Pistorius, however, managed to be the first amputee to make a World championship semi-finals with his incredible finish in the 400m. Check out how fast he gets going in the straights...amazing! Britian's Mo Farah and Ethiopia’s Ibrahim Jelian made the most of Bekele dropping out (his first non-win at a world championship ever) to duke it out in the 10,000m, with Jelian outkicking in the last 50 meters for the win (27:13). Lots of great running going on in Daegu! Do you have a drawer full of finisher medals from all your marathons, ultras, or triathlons? Have you ever wondered if they could be used for more than your "Me Wall" (where it's all about ME) or the occasional dress up with your kids? I went digging around and found an organization called Medals4Mettle that facilitates getting your medals to recovering patients, kids for the most part, who use the medals as a source of strength to get to their own finish line. The more I investigated, the more I realized that these finisher medals are worth their weight in karmic gold. 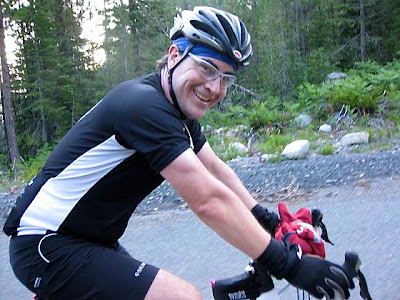 Medals4Mettle (M4M) was started by Dr. Steven Isenberg, a head and neck surgeon in Indianapolis who had impulsively given his finisher medal for the 2003 Chicago Marathon to a friend surviving cancer, feeling that his marathon finish paled in comparison to his friends struggle. Later, that friend would tell Dr. Isenberg how much the gesture meant, and how the medal continued to be a source of strength. Seeing a chance for good on a large scale, he started the non-profit, which has already helped place over 17,000 medals, largely to children's hospitals. 1) M4M is a great idea. How did it get from the inception in 2003 to a full-blown non-profit? It was Dr. Isenberg who took the initiative, realizing that all that was needed was a go-between to collect medals and match them up to patients and hospitals. We are continuing to grow through a network of volunteer coordinators who can help on a more local basis, and the word continues to grow and more and more get involved. 2) How many finisher medals have you given to patients so far? How do you choose who gets them? We’ve donated over 17,000 medals since the inception of the charity over 6 years ago. Who receives a medal is at the discretion of the coordinators. We simply ask that the recipient be a person who faces challenges on a daily basis that we take for granted. Our hope is to acknowledge and encourage a person, basically make them feel like they are winners and just crossed a finish line. The largest recipients of the medals are children in hospitals but we would never turn away any agency that would benefit from our charity. Our recipients range from cancer survivors to patients in VA hospitals, and anything in between. 3) Can anyone donate a medal? Do you have demand for specific races or kinds of races? 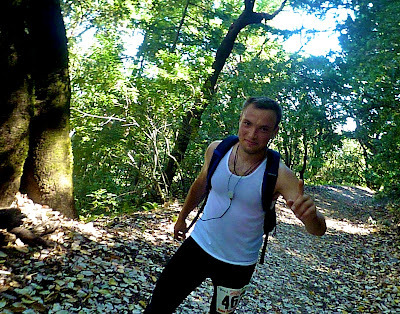 The readers of this blog include a wide range of endurance nuts, from triathletes, to ultra marathoners, to adventure racers. Yes, anyone can donate their medal as long as it is earned (no surplus medals from race directors). Our charity only focuses on running related endurance medals (half marathon distance or longer, and any distance triathlon). Disney medals are the most popular with kids, but all medals are accepted and greatly appreciated. 4) What's the biggest donation of medals you have ever received? At one Indianapolis Mini Marathon, we received over 400 medals. But every medal makes a difference. 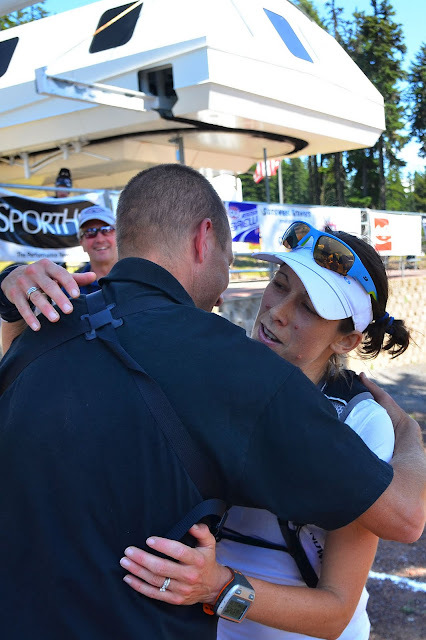 We have been lucky that some professional athletes like Brian Sell and Bonnie Blair have donated their time and medals, which is helping get the word out. 5) I love that M4M makes philanthropy so accessible. Can someone donate a medal alone, or do they need to send cash too? We attach our signature silk ribbon to each medal, emblazoned with the M4M logo as a way to link our organization to the medal. Our coordinators are responsible for raising funds to purchase those ribbons and we sell them to our coordinators at cost. Some people would rather donate a couple dollars rather than part with their medal. Both forms of donation are greatly appreciated and will be put to good use. 6) If somebody wanted to personally adorn a medal to a patient, could they do that? Yes, we do sell ribbons from our website for just such an occasion. We’ve also helped whenever a donor has requested that a specific medal go to a specific person. You really get to understand how much these medals mean to the patients when it's done in person. 7) How else can we help get the word out about M4M? I would answer that based upon a person’s interest. If you have ties to the running or triathlon community, our cotton t-shirts are great conversation starters, and can be purchased through the website. 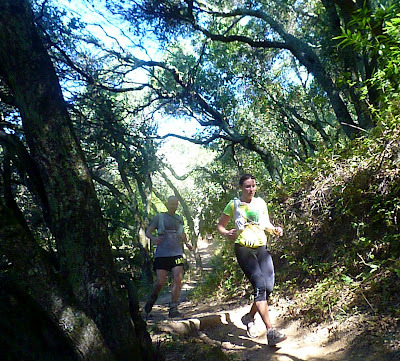 Consider mentioning our charity in a blurb on a local running newsletter or website link. If you have ties to the medical community, help us find an organization that could benefit by receiving our medals. If neither of those fits you, please consider helping raise funds for our ribbons. Become a ribbon-a-month donor, have a bake sale, challenge your friends to top your donation. Even if our charity is not a good fit, then find one that has meaning to you. I promise, few things will give you more joy. Thank you, Bill, and good luck! What a crazy weekend of running! Dave Mackey set a new CR at the Where's Waldo 100k to open the new Montrail UltraCup Series with a bang, with Ian Sharman taking second. 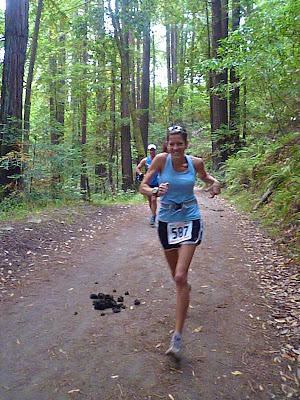 Aliza Lapierre wins the Women's division (10:33). South African Ryan Sandes clocked a blistering 16:46 at the Leadville Trail 100 for the win, while 2009 champion and local Lynette Clemons won the Women's division in a PB 19:56. The unstoppable Matt Carpenter wins the Pike's Peak Marathon for the 18th time in 3:48 at age 47, 23 years after his first win in 1988. That's 18 for 18 for Matt! The Gore-Tex TransRockies Stage Race kicked off, with the mighty duo of Jeff and Katie Caba getting a 40+ minute lead in the 80+ Mixed division in the first stage. Go Cabas! Team Inov-8 teammate Ben Nephew was the fastest American at the IAU 50k World Trophy, clocking a 3:13 for 11th overall. Phew! That's a lot of racing! 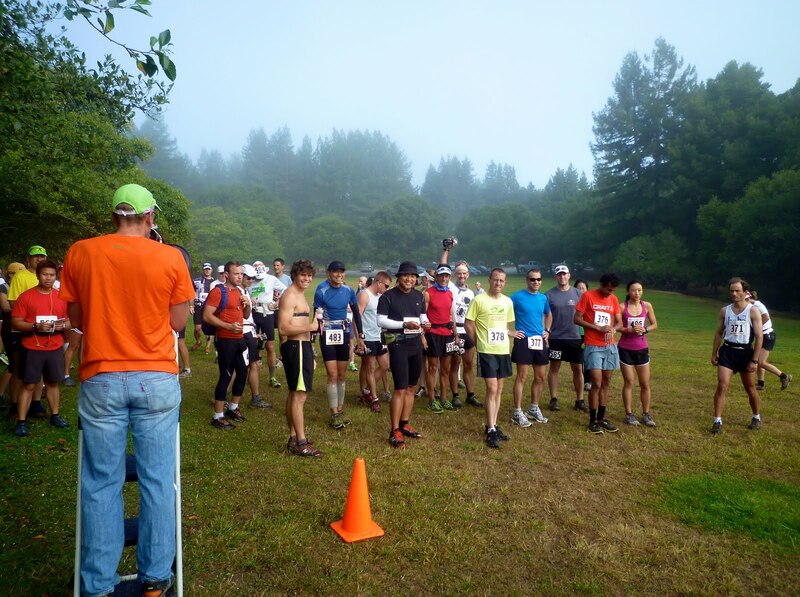 The Crystal Springs 50k - My Last Woodside Race Ever?!? As I pinned my number on for the summer edition of the Crystal Springs 50k in my backyard trails of Woodside, CA, I looked forward to joining 200+ trail runners for what might be my last race as a local. What, you say? Well, Christi and I have been pondering career moves that might take us to Washington, DC, or Austin, TX, and the deadlines to choose are coming up soon. So today, I run with a new appreciation for these trails that have been a daily treat for the last decade. I've been surprised at how deep my roots have become in this area, particularly for our nomad household that has previously relocated every couple of years in pursuit of adventure, careers, school, or just a change of pace. This time, however, it's different. Kids, trails, friends, rituals a decade deep...I can feel the stretch of thick, strong roots that won't let go without a fight. 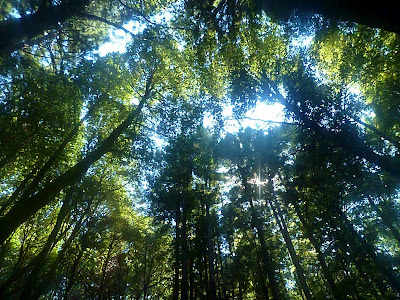 Then again, we never would have found Woodside if we hadn't been willing to move someplace crazy new. 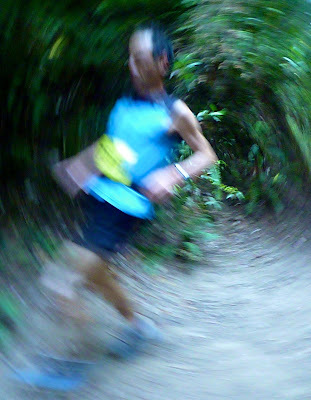 My senses felt hyperjacked as Race Director Wendell Doman counted us down at a foggy starting line. It was going to be a warm day thanks to the inversion that keeps the top of this mountain in the low 80's even at 8am, so best to enjoy the cool while we can! I put in a few miles of hills in the hour before the race start, getting my legs good and sore as part of my Wasatch 100 training. At Werder Shelter in Huddart Park, I caught up briefly with the Coastal Trail Run gang and joined the start line, noting that both John Burton and Rudy Montoya looked insanely fit and ready to go. There was a 5 mile, 11 mile, 22 mile, marathon, and 50k option today, and the 22+ mile runners all went out together in the first wave at 8:30am. 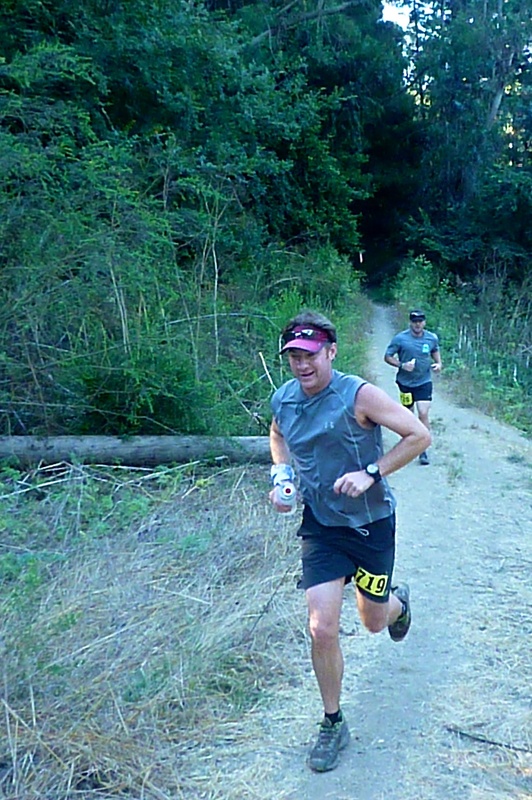 Rudy kept pace with the 22-milers, disappearing in the first mile of single track while the rest of us chugged along towards Richards Road. 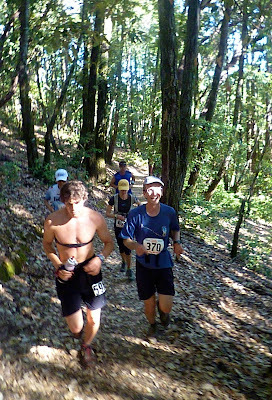 As we entered the first of two big climbs (mile 3), I had a nice little chain gang going with Jon Burg (power hiker extraordinaire), Mark Dorman (heat trained from his usual Fresno runs), John Burton (getting over tendonitis), Riley Reese (Berkeley grad student), and marathoner Anne Cottrell. We relived our favorite parts of the Tour de France, recounted our spring races, and kept a comfortable pace as the temperature climbed with every step. The first aid station (mile 6 - my driveway!) 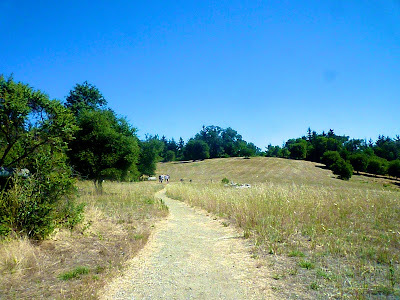 was already toasty, and we all refilled for the trek out to Wunderlich Park. T-shirts came off and water was consumed quickly, and the 22-milers stepped up their pace knowing their big climbs were done. 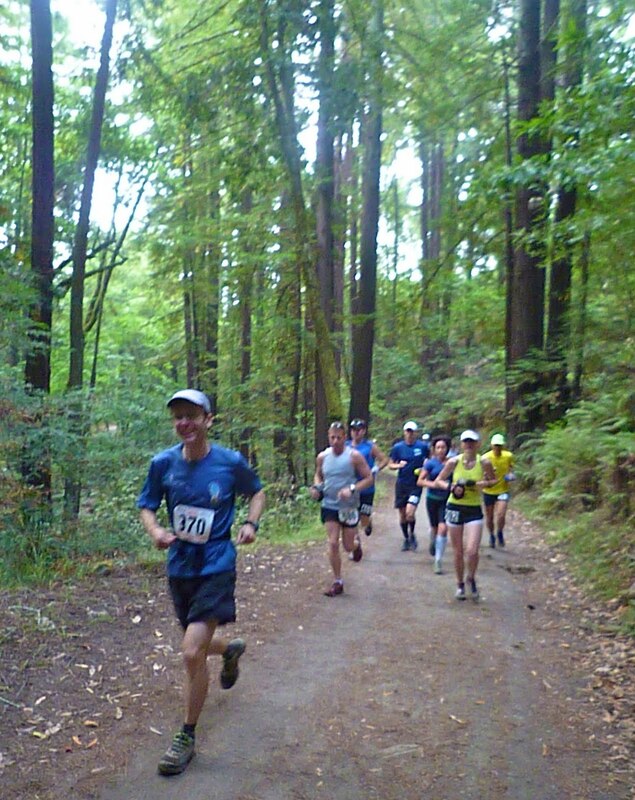 Ankur Tarneja led the 22-mile race by nearly a mile at the turnaround, and we all thought for sure he was lost! Nope, just fast. 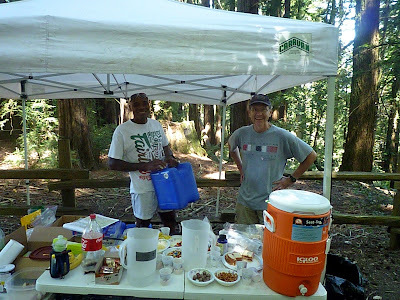 We found the second aid station in Wunderlich (mile 11), and most of us had run out of water. 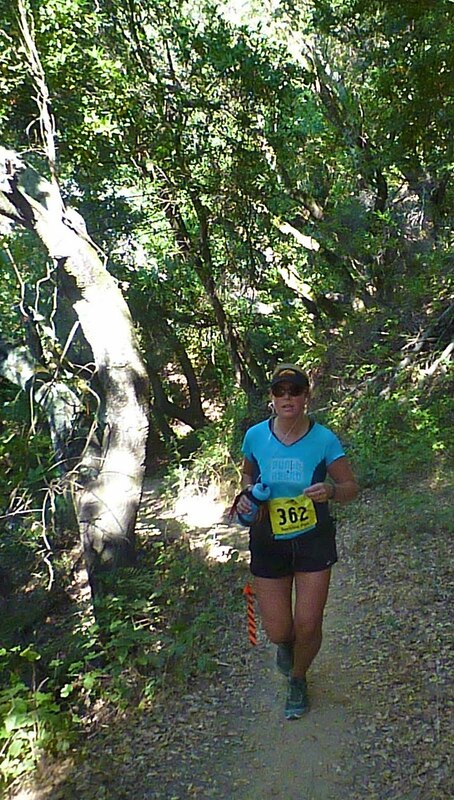 I got to the aid station first and did a quick refill, which allowed me to start the descent alone. I knew Rudy was up there somewhere, but I would need him to ease up in the heat if I had any chance of catching him. Wunderlich was downright hot - one of the hottest afternoons I can remember - and the exposed areas were well over 90 degrees. 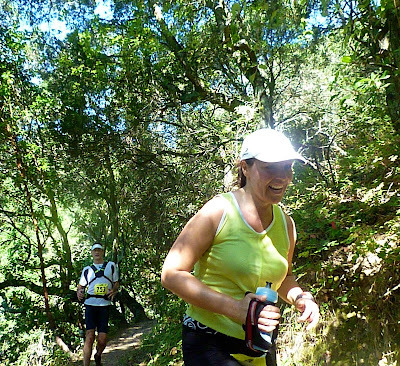 This forced a slow down in tempo, particularly as I reached the bottom of the loop and began the climb (mile 17). But it also gave me more opportunities to absorb the sounds, smells, and sights that I have taken for granted for so long! 2,500 training runs in this park...how could I have missed these details? A couple of wasps decided two runners was enough in their neighborhood and attacked, forcing a sprint to avoid any more than a few stings. Damn! You can't even see those guys coming. 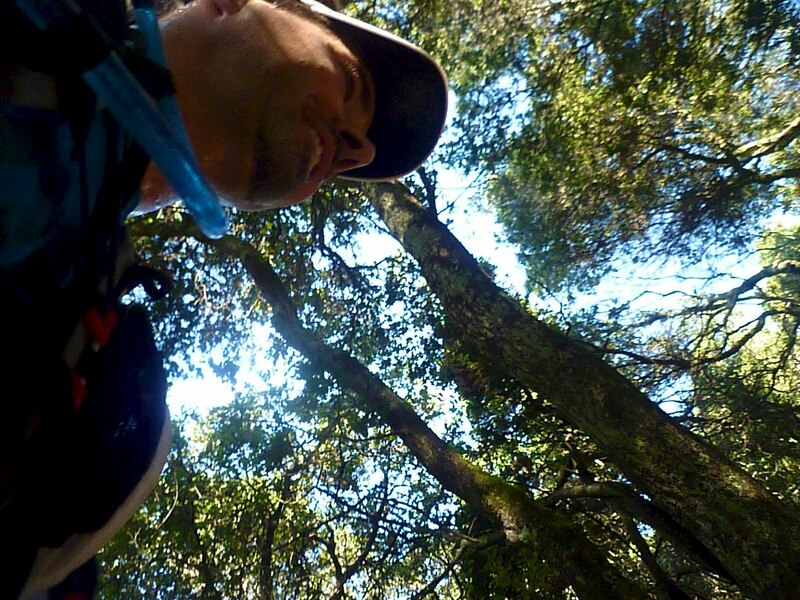 I made my way to the aid station (mile 22), once again out of water and feeling on the light (-headed) side. The volunteers took good care of me, feeding me flat Coke, PBJ's, and about half of a quart of water. Rudy was apparently a good 15 minutes ahead of me and "looking determined". I could risk dry heaving and charge into the heat, or just cruise in 3rd gear and enjoy my surroundings. This could be the last Woodside 50k, Scott, so let's get as much time as we can. One of the best parts of this course is the ability to catch up to a number of runners along this stretch, and I enjoyed using the camera to share a smile with them. Everyone was enjoying it! 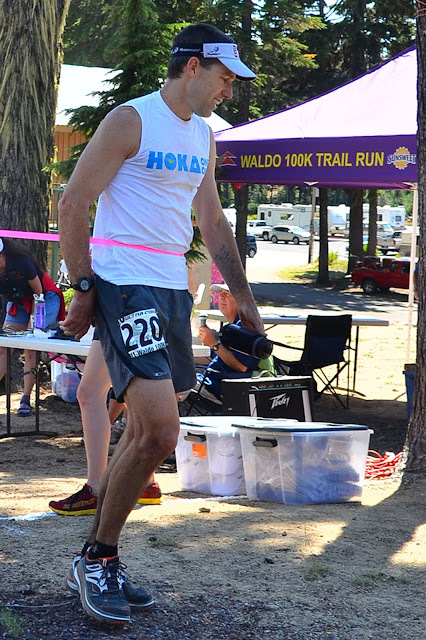 At the last aid station (mile 26.5, back at my driveway), I decided to change things up a bit and swap my speedy Inov-8 295's for some bombproof Hoka OneOnes. I've heard a lot about these super-fluffy shoes, in particular when used in the final miles of a 100-miler for some reduced impact, and was curious to feel what these pillows were like. It didn't take long to find out! On long descents, you can just fly as the wide platforms absorb everything. Although they aren't much faster descending than other shoes, the impact on the feet and calve muscles was dramatically minimized. Traction was a problem only when you came into a switchback, thanks largely to your center of gravity being two inches taller than normal. It took some getting used to. I came into the finish chute in 4:44, good enough for second place behind Rudy (4:27:40) who had charged the whole way. Riley Reese came in a few minutes behind me (4:48), and we all mentioned having to slow significantly on the climbs due to the heat. Julian Whitelaw triumphed in a close race with Amanda Newell to win the Women's division (all results). Everyone gushed about how gorgeous the course was, telling stories of pigs and goats that got loose on the trail, bobcat sightings, sunning ghekos, and the oh-so-refreshing pockets of cool air that snuck over from the coast in the afternoon. (The canopy protected us all day...and most of my last decade! My roots are deep here, so much so it would be impossible to stay away forever. Huddart Park and Woodside, and the trail running world they brought to my doorstep, will always be a part of who I am. I feel lucky and honored to call it my home for as long as I can. Thanks to Wendell and the gang for great race! Last Sunday, I had the great pleasure of joining 700 cyclists for the 2011 Mount Shasta Summit Century Ride in Northern California. 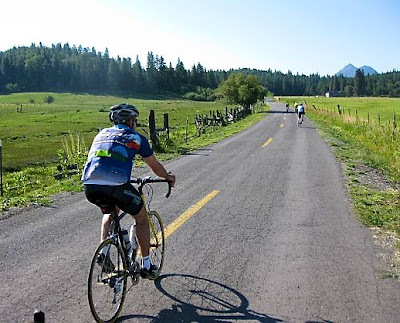 This 139-mile ride tours through some beautiful hill country, and with 16,500'+ of climbing that concludes on gorgeous Mt. 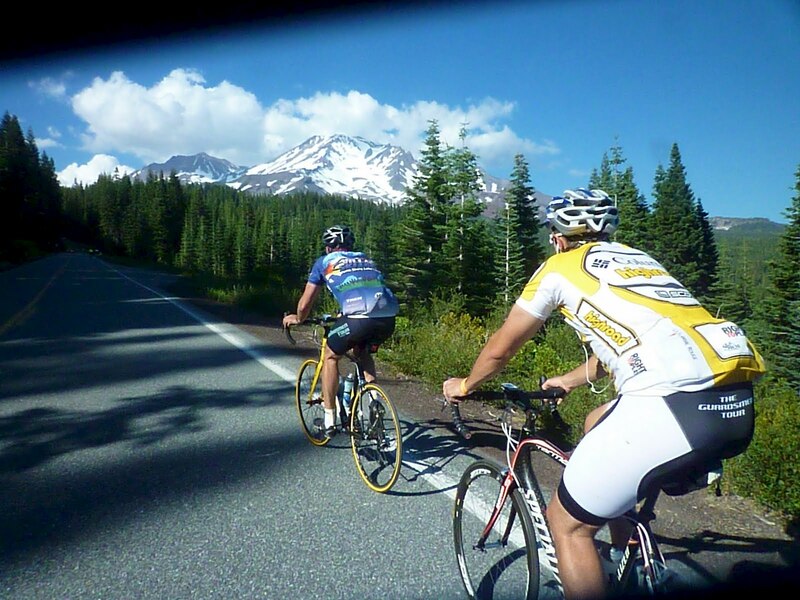 Shasta, it presented an adventure worthy of a now-annual "dudes weekend" with my cycling buddies. We drove up the day before, excited for the good weather projected to peak in the low 90's, and nervous that the bike rack was worth four times more than the car it was attached to. As we approached the Mt. Shasta exit of I-5, it was clear that we were among our people, for every car had a similar investment ratio, and that same nervous passenger in the back seat fixated on the bikes with unblinking eyes. We collectively sighed relief as we filled Mt. 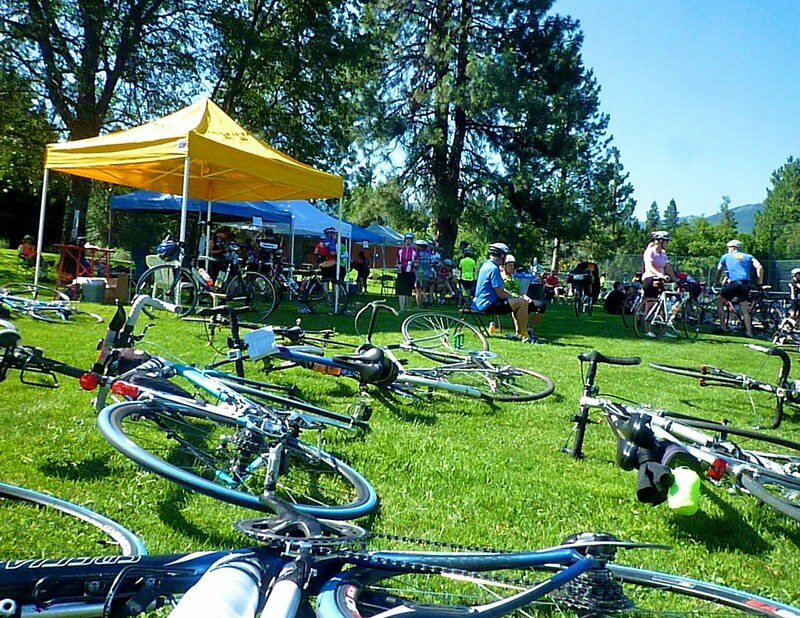 Shasta City Park for registration, relaxing in the low-key vibe of a small town ride. 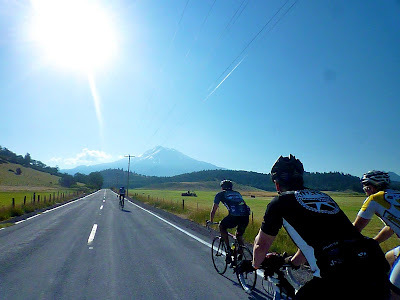 The "Super Century" is the longest option at 139 miles, so like any group of dudes is prone to do, we signed up for the longest option regardless of our level of training. But I was glad to see that this gang of five was looking pretty fit for a group of dads in their 30's and 40's, and they knew to take the mileage seriously. Otherwise you would have to drop out early, and endure the required year of hazing for such a tragic move. The pictures alone...I can't imagine that kind of pain. 4:30am PB&J's got us on our way, and we relied on the headlights of Dan (aka, "Diesel Dan") and Brian (my brother-in-law) to lead us through the first 10 miles. Leave it to my former Western States crew members, they were prepared! 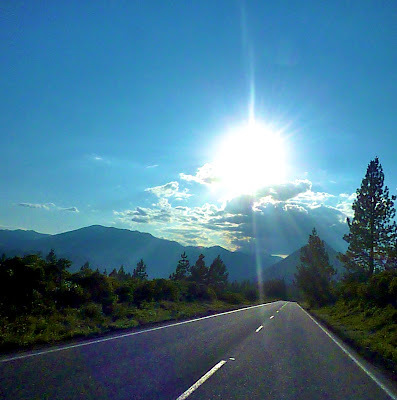 The roads were CRAZY smooth, and there wasn't a car in sight as we entered the first of four climbs and watched the sun rise behind Mt. Shasta. Chris Devine (aka, "Devo") was our local tour guide, a resident of nearby Chico, CA, who had just finished a long ride in nearby Lassen Park. He pointed out to us that most of the climbs would be like the first one - tall (3600' of climbing) but not a high grade, with 8 miles to get there. 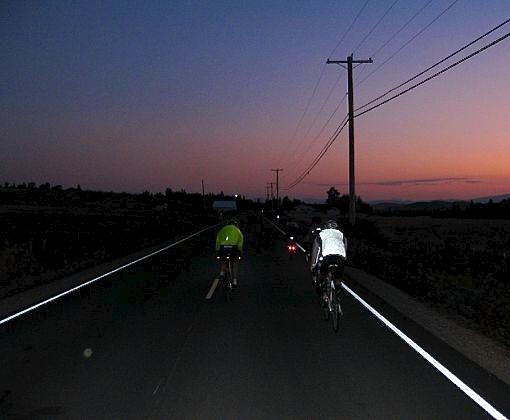 It was a comfortable pace, just enough to keep a breeze going, instead of an out-of-the-saddle grunt fest. 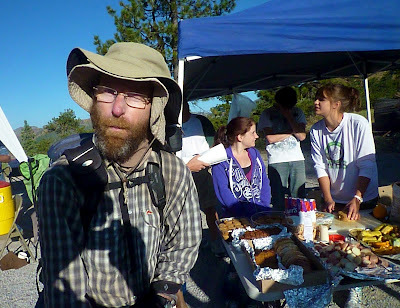 We met some characters at the top of the first climb, none more so than "Two Hats", a through-hiker from Australia who had started up the Pacific Coast Trail in Mexico 90 days earlier, on his way to Canada. Lets just say he was pretty stoked to see a bunch of people AND a bunch of fresh cut watermelon. 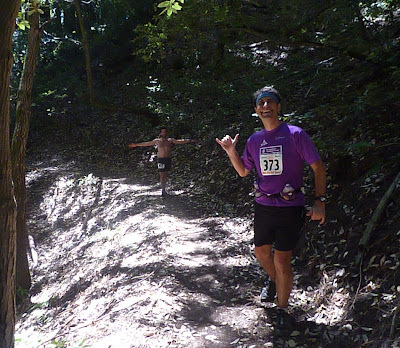 The descent was smooth and easy to navigate thanks to an insanely well marked course. They even highlighted divots in the road with neon marker so you could spot them on descents! It provided a nice level of comfort for these 35-45 mph plunges. I bet the pros on the TdF would go for that. 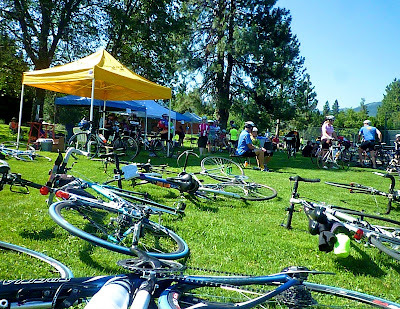 We spilled out into the farmland, taking a tour through Weed, CA (where "I *heart* Weed" t-shirts mean something completely different than any other college campus) and finishing 50 miles by 9 o-clock. Phew! We were making good time. Unfortunately, we had to stop for a mechanical issue as Mark Dabell's headset kept coming loose. He would have to stay behind for 20-30 minutes to get it fixed, but would catch up. 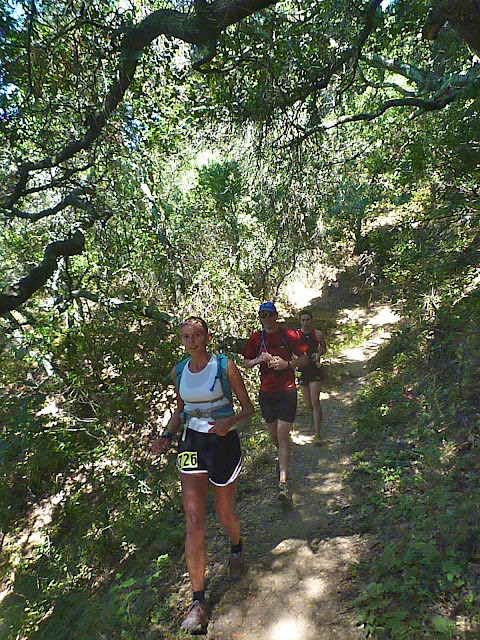 We charged into climb #2, the 3300' ascent up Mumbo Summit. Similar to the first climb, most of it was long and easy, but the heat was becoming a factor. A few steep pitches near the top had some riders criss-crossing the street or seeking a shady spot, but nobody was quitting! Before too long, we arrived on top and took a break to cool down. Lipton Brisk was going down a bit TOO easy, as I chased down 2-3 in one sitting. 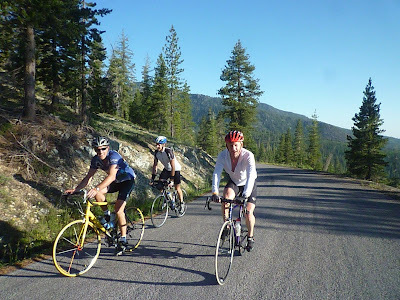 As we descended, we ran into Dabell with less than two miles of climbing to go, but he chose to descend with us and save some for climb #3, the steep 2200' climb in the hottest part of the day. That proved to be a good move. 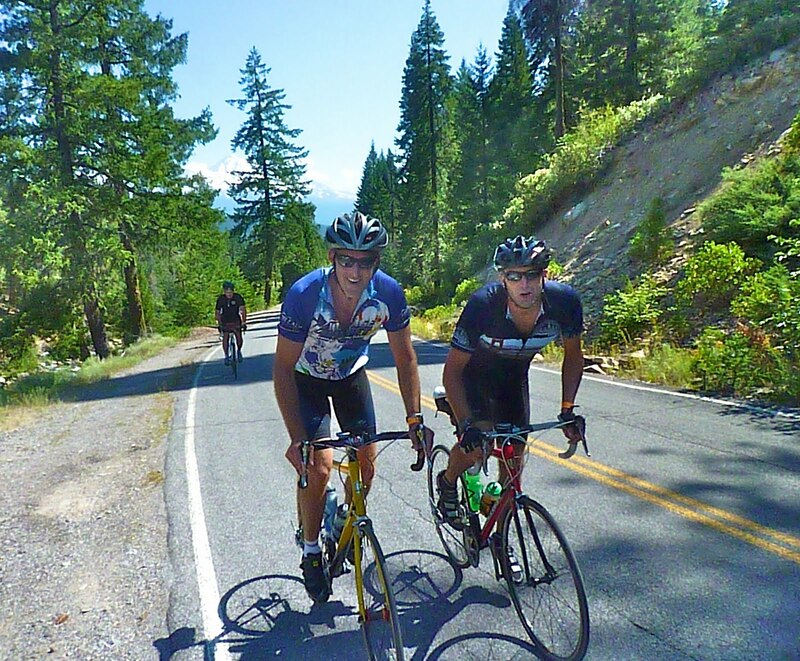 This climb was the first time the group split, and it was the heat that did it. Within minutes, Brian said "F THIS!" 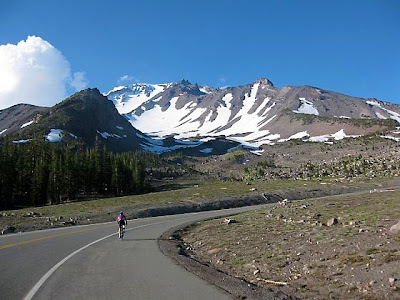 and charged to get through the steamy heat quickly, while I found the happy medium of a fast aerobic climb that gave just enough breeze to not fry. 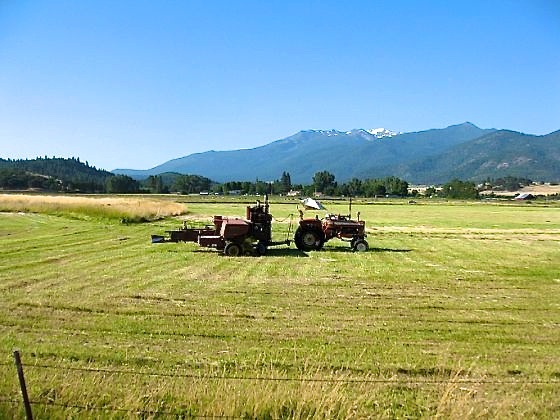 The rest thought it best to conserve, and found a slower pace to their liking. Soon enough, we all made it to the top within two hours and could sit by Mountain Lake and enjoy the graciousness of their volunteers. I loved the fact that our riding group knows each other so well, that nobody has to wait for anyone! We came into the lunch stop around 3pm, already 101 miles under our belt and still needing to tackle the 4400' climb up to Old Ski Bowl on Mt. Shasta. Everyone was looking good, showing only the slightest signs of wear and exposure (much in thanks to regular intake of S!Caps, a secret we learned at The Death Ride). Sore asses were wondering when the madness would stop. Just. One. More. Hill. 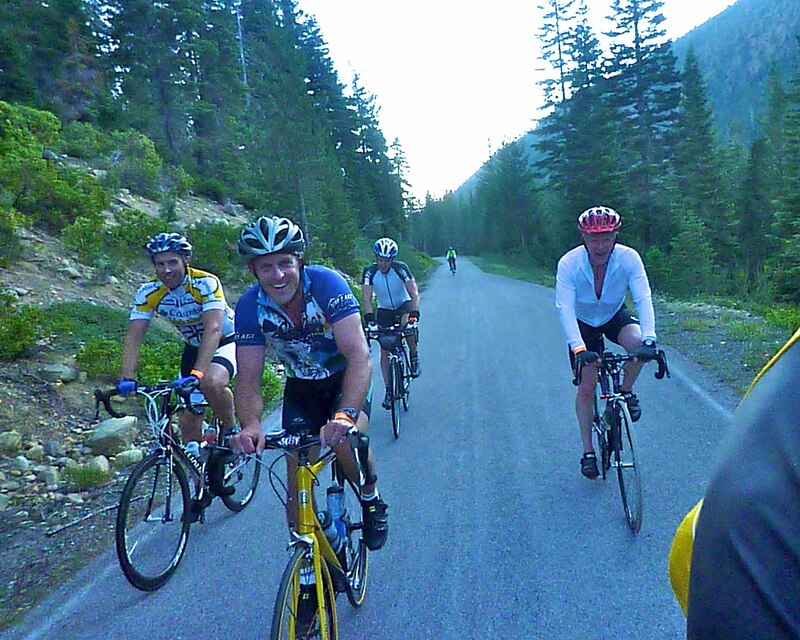 Only a handful or riders were around us as we took off up Mt. Shasta, and it was great to catch up and talk with people we had only previously identified as "Canada" (woman with a national jersey), "Beard Guy" (shoulder-length beard that parts down the middle on descents), "Sausalito" (guess where he's from? ), and "Ripped Dude" (no explanation necessary). 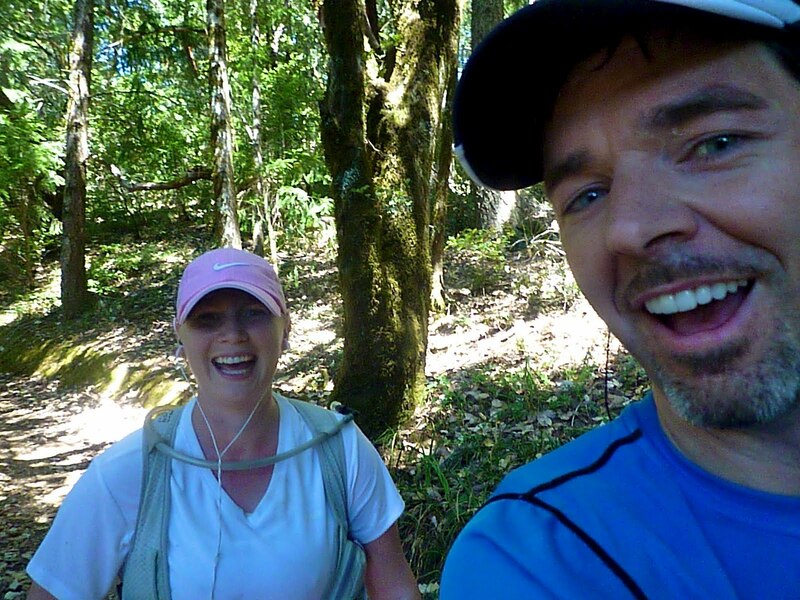 We had 3.5 hours to climb 16 miles, then turn around and descend in less than 20 minutes. Fun! 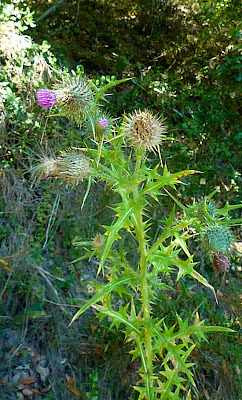 The stagnant heat came out on the first long stretch, and there were a few groans from the pack as the road pitched up. One happy group of supporters doused is with all the water they had (which was a lot), complete with a nice little shove up the hill. Allez! Allez! But for the rest of the climb, it was heads down, no talking, just you and nature. 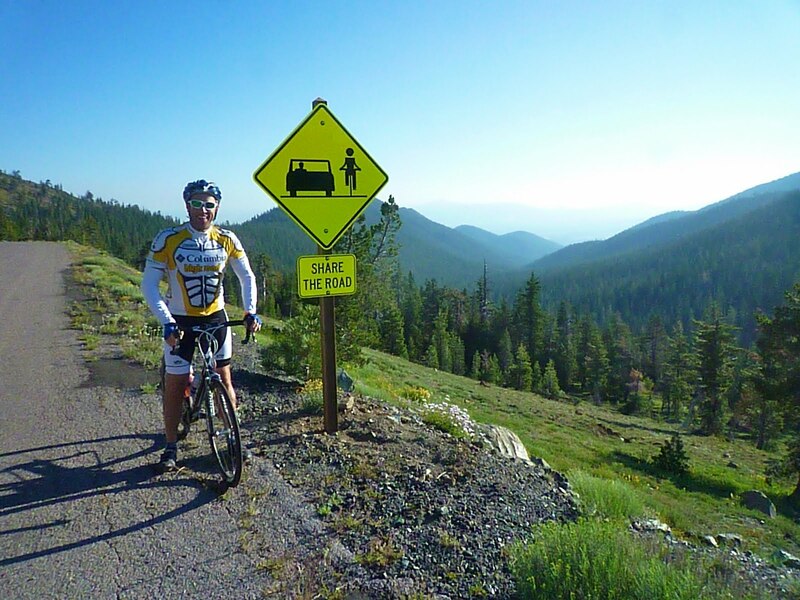 We all found that place of truth and pedaled. 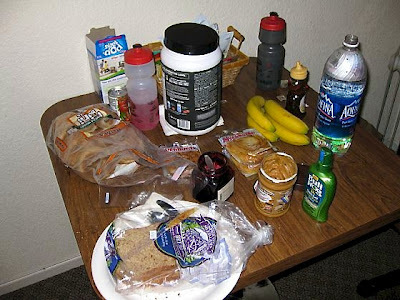 I had taken good care of myself today, with Vespa, plenty of S!Caps and water, sunscreen at every stop, and not holding back at any aid station buffet. Plus a good aerobic base from being unemployed was helpful. ;-) I seemed to have one gear left - about 140 watts - which was enough to leapfrog back and forth with Brian and Dabell towards the summit, with Devo and Dan not too far behind. The road was amazing, weaving up the hill in long smooth turns. This was going to be a great descent! 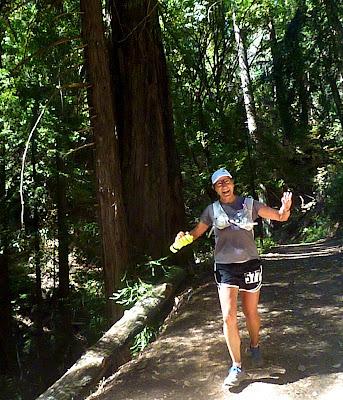 I cruised through Bunny Flats (3 miles to go! 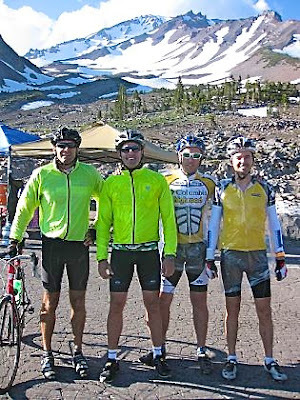 ), while Brian and Dabell stopped to take a picture to memorialize returning here after an ascent on Shasta some 12 years ago. These are some old friends! We soon broke free of the treeline and make the last few switchbacks to Old Ski Bowl, which at 7,700' feet, was only half way to the top. We enjoyed some snacks in the belly of the mountain, joining with the volunteers to provide a small cheering section for fellow finishers. Brian had finished next, then Devo, then Dabell, but Dan was still on the hill. The clock said 6:10pm...aid station closes at 6:30pm. C'mon, Diesel Dan!!! Our spirits lifted when we found Dan just a mile down the road, easily making the aid station in time for a daylight descent. The highway stretched out and let us soar down effortlessly, as we chased the sunset through the clouds. Beered and showed, we headed to Goat Tavern to feast and relive our favorite moments of the day. Our bodies were so starving, any plate of food brought to the table would be consumed in seconds in a "speed dating" format, rinsed with waves of red wine. We deserved the dark seat in the back of the deck, I'm sure, but took the responsibility seriously. This annual trip blossomed from a dare among friends that was always one-upped, and it is already creating a legacy of stories full of fun, adventure, and far too many ridiculous dude cliches. We said "see you next year", knowing this was true for many of us, but smiling aware that we would ride again soon. Oh, yes, we will ride again!